You can use this page two ways: Simply as a percentage calculator, and/or, you can take the time to actually learn how to calculate percentage. We give you different ways and scenarios of calculating percentage. 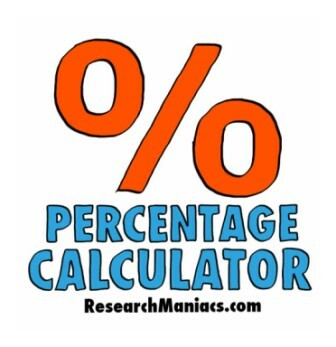 First we give you examples of real world percentage calculations. Second, you can enter the numbers to see the answer. Third, we explain how we calculated it. This is your one stop Percentage Calculation tutorial. It is really easy if you remember one thing: percent means "per 100". What is X percent of Y? For example: The shoes you have been dreaming about are $45, and they are on sale at 20 percent off this weekend. How much do you save? In this example X is 20 and Y is $45. If you enter the numbers in below, you will see that you save $9.00. What is X: percent of Y: ? X is what percent of Y? For example: You think the car salesman was really nice because he gave you $750 off the car you bought for $29,000. In this example X is 750 and Y 29000. If you enter the numbers in below, you will see that he gave you a 2.59% discount. Not exactly a good deal! You may want to check out How to buy a car. X: is what percent of Y: ? What is the percentage decrease from X to Y. For example, You figured out How to Lose Weight and your weight went from 159 pounds down to 140 pounds, where X is 159 and Y is 140. What percentage did you lose? If you enter the numbers in below, you will see that you lost 11.95%. Good Job! What is the percentage decrease from X: To Y: ? What is the percentage increase from X to Y. For example, your salary increased from $500 to $600, where 500 is X and 600 is Y. What percentage did your salary increase? If you enter the numbers in below, you will see that your salary went up 20%. That's a nice salary increase! What is the percentage increase from X: To Y: ?